Rick Egan | The Salt Lake Tribune Steve Urquhart moderates a panel of state and community leaders as they discussed issues surrounding homelessness in Salt Lake County at Salt Lake Community College South City Campus, Monday, February 13, 2017. Former state Sen. Steve Urquhart on Friday criticized how he says the LDS Church lobbies legislators from the shadows — including how it used its influence first to fight gay-rights bills he pushed and later to enact them. 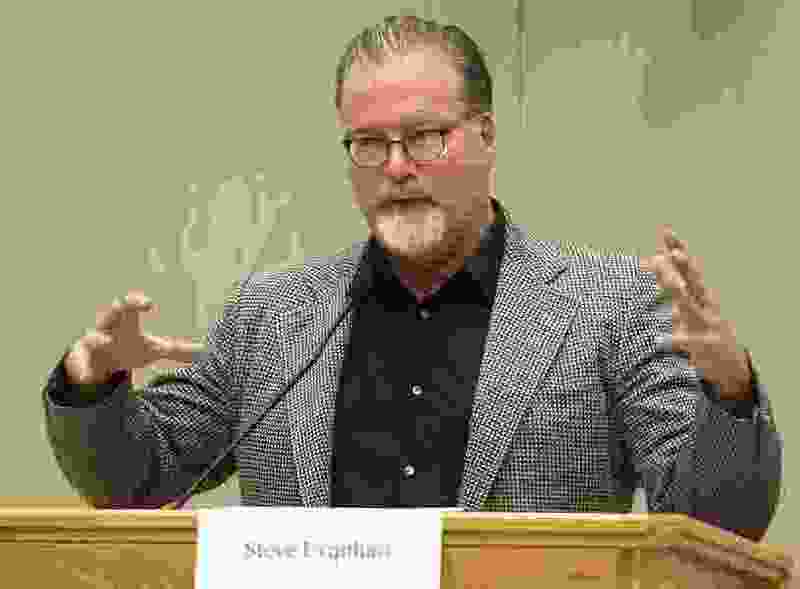 The St. George Republican recounted his experiences in a long Facebook post, prompted by the decision of legislative leaders to hire the church’s top lobbyist, John Cannon, to direct its Office of Research and General Council. Urquhart said he has no problem with the hiring of Cannon — but launched into a long criticism of church lobbying that he says is too secretive. A 2016 review by The Salt Lake Tribune found that 88 percent of Utah lawmakers are Mormon, compared with about 61 percent of all state residents. The LDS public affairs office did not immediately return a request for comment Friday. Urquhart said he saw such secretive lobbying work against, and later for, gay-rights bills that he pushed for years. 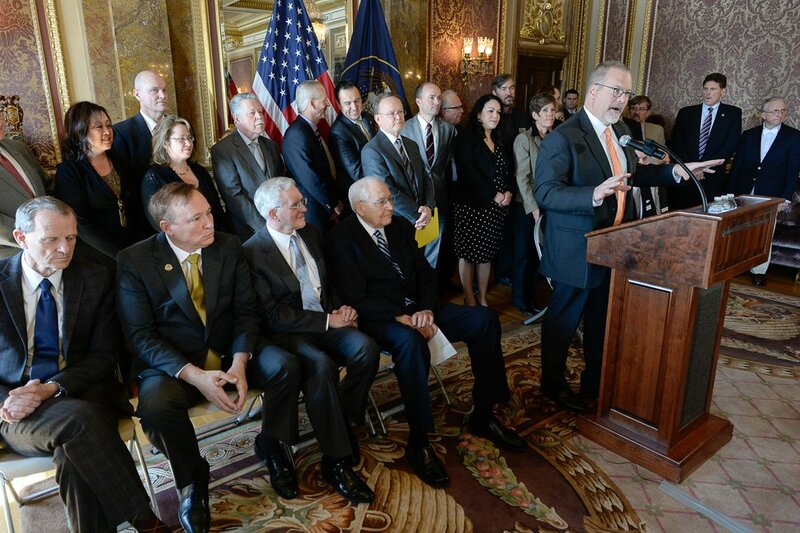 Francisco Kjolseth | The Salt Lake Tribune Senator Stephen Urquhart, R-St. George, is joined by senators, representatives, LDS leaders, and members of the LGBT community as he discusses the fine points of the nondiscrimination bill SB256, during a press announcement at the Utah Captiol. He added that the church misled him even in 2015, insisting it was pushing no LGBT-related legislation that year besides what was in his bill. Despite all that, Urquhart said he does not have a problem with the hiring of Cannon, the former top church lobbyist, to head the Legislature’s research and bill-drafting office. Cannon had been a legislative staffer before he went to work for the LDS Church. Urquhart’s comments are not the first time that former legislators have created a stir about LDS lobbying. In 2015, former Rep. Carl Wimmer — who left the LDS Church to become an evangelical Christian — accused the church of bullying Mormon lawmakers on such controversial topics as illegal immigration, alcohol and gay rights. The former Herriman Republican compared meetings between Mormon church lobbyists and select lawmakers to LDS priesthood interviews and alleged that his local church leader contacted him directly to vote for a bill favored by the faith. A couple of former legislators backed Wimmer’s claims. A far larger group of Mormon lawmakers said they never experienced the kind of heavy-handed tactics that Wimmer described.